Finally! This is the conclusion of Eloisa James’ serial novella. It gave me what I’d been waiting for. My notes throughout this story have been *sighs* and *crying*. Sometimes my stomach hurt for the characters and well… I was blissfully happy when the story took a hotter and happier turn for Colin and Grace. 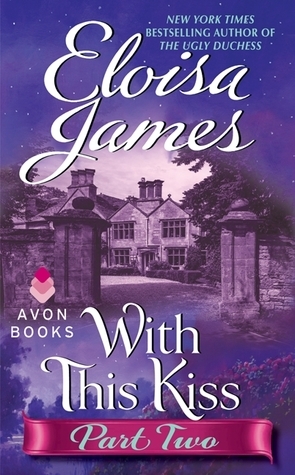 This is part two of Eloisa James serial novella With This Kiss. This book is putting me through the wringer! I’ve been emotional anyway and the happy and sad, ups and downs of Grace and Colin’s journey made me cry. Real tears! I’m so impressed that in such a short story I really was all wrapped up in these characters lives. How have I not read Eloisa James before? Oh my oh my oh my. In a short amount of time she grabbed my heart and my attention. I was highlighting throughout this story and my notes were smiles and sighs and the word crying. Seriously, I was impressed with how fast I got sucked into this historical romance. Bonkchair Chat with Codi Gary! Codi’s debut was on Tuesday with the release of the Kiss Me anthology. I had to twist her arm (not!) to get her to sit down on my couch aka Bonkchair for a chat. I’ll have her other playmates, Cheryl Harper and Jaclyn Hatcher visit The Book Tart soon too… Just need to get the cupcake crumbs off the cushions first! I want a fireman! <g> I finally read Jennifer Bernard’s The Fireman Who Loved Me and I am regretting not snagging it from my TBR pile earlier. I mostly read PNR and UF but have just recently began adding some contemporary romance back in the mix. I soooo enjoyed this book! The characters are very well developed and felt real. I loved watching the dance between Melissa and Captain Brody. The dialogue is witty and snarky and fun and there is some steamy fun in this story too. I blazed through the book and am excited that I have book 2, Hot For Fireman waiting for me and I just checked Jennifer’s site http://jenniferbernard.net/extras.php and book 3 is scheduled for January 2013!